MRHESLOP.com announced as sponsor of Disability Futsal. Today we’re delighted to announce MRHESLOP.com as the major sponsor of Disability Futsal. 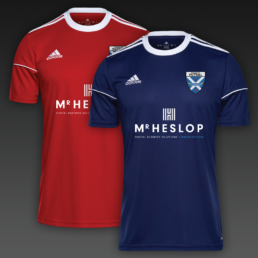 The first stage of the sponsorship agreement is the provision of 40 fully customised Adidas squad kits for our Glasgow and Clydebank teams, coaches training outfits, and professional futsal goals. Disability Futsal teams were set up in Glasgow in September 2016 and in Clydebank in December 2016 for the purpose of providing more opportunities for people with Disabilities; to help them develop further as players and aid players who will be representing Scotland West in the upcoming Special Olympics. In 2017 our goal (excuse the pun!) is the creation of a football league, and organisation, dedicated to disability futsal. MRHESLOP.com offer digital business solutions to companies throughout the uk and across the globe. The sponsorship, and business, is a great fit for the impending challenges that we’ve set out to achieve this year, and beyond. Jason Methven, creator and head coach of Disability Futsal in Glasgow and Clydebank, and current football coach at Enable Glasgow and Glasgow Life, commented: “Futsal is a great thing and is going to become hugely popular, It is fantastic to watch our players leave at the end of the night with a huge smile on their face. To get a sponsorship opportunity like this is just very humbling and I am delighted to link up again with Dave and with Mr Heslop on what will be a very exciting journey. The future is bright, the future is futsal”. Disability Futsal is seeking members in the Glasgow and Clydebank areas. If you are interested then please do get in touch! The Disability League starts in March the 13th and will provide a regular match every week. The Clydebank club trains at 6.00 – 7.00pm every Wednesday at Dalmuir Community Centre. The Glasgow club trains every Thursday 5.30 – 6.30pm at the ARC in Milton. Contact JASON on 07960435179 for further details.